Welcome to We Do Stuff, today I’m going to review the Red Dragon Centrophorus. First of just some basic information about the Red Dragon Centrophorus. Inside the box you get the mouse itself and a user manual. No CD included, if you want the software you will have to go download it from there website. The entire top of the mouse has a rough surface that will improve grip. But after a lot of use I know the surface is going to become smooth. The rough surface isn’t uncomfortable though but you do feel the coarseness. Starting at the front you have the left and the right mouse buttons. The scroll wheel has rubber grip for better scrolling and is able to click down, unfortunately, no side clicks. Behind the scroll wheel is the DPI section switch. This button allows you to select between 4 different DPI levels. Each level as a specific color and will illuminate the area just behind the switch. The palm rest has a Red Dragon illuminate logo with 2 illuminated strips going down to the left and right side of the mouse. Unfortunately, you are not able to change these the LED colors. On the left side you get 2 thumb buttons that’s nice and easy to press. The front button is textured and the back on is smooth, this is just to prevent your thumb from slipping while gaming. The mouse also has a textured pattern to prevent slip, but it’s only a plastic texture not rubber so if your hand gets a bit sweaty you will lose a lot of grip. On the right side you get the same textured pattern from the left side, but no buttons. So if you are a lefty you can use the mouse you just won’t have any thumb buttons. 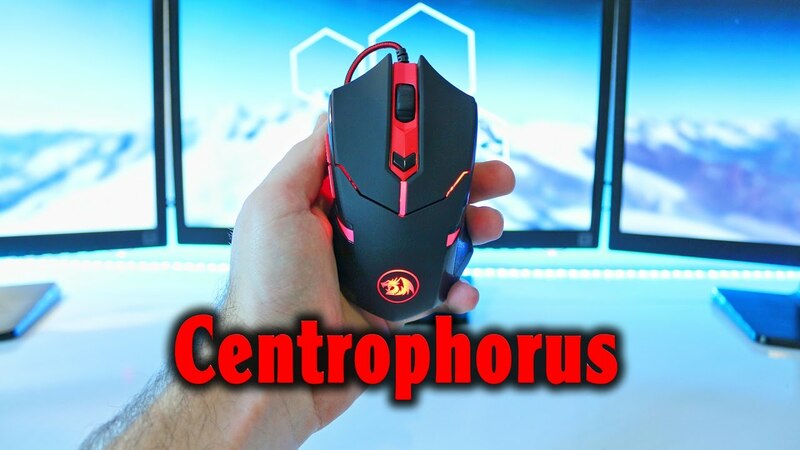 Underneath the mouse you get 4 smooth Teflon mouse feet, the optical sensor with a max DPI of 3200 and then also a bay for your weights. Twisting the open you get 8x 2.4 gram weights. So if you like a light mouse you can just take out all of the weights. The cable is a 1.8 meter (5.9 feet) red and black braided cable with a gold plated usb connector. The software you’ll have to download from Red Dragons website. There’s not really anything fancy about the software, you are able to assign different commands to 5 of the buttons and the rest is the same as the mouse settings in Windows. The software is really lacking, there’s no adjust of the DPI levels or even LED effects. Luckily of the 3 Red Dragon mice I have reviewed, this is the only one that doesn’t have custom software.